After three years of the heading the organization, UN Women, which strives for international gender equality and empowerment of women, Michelle Bachelet returned to her seat as president of Chile. This is her second term in office and she is focusing especially hard on equality for women. As the leader of UN Women, Bachelet and other diplomats, worked on the 58th session of the Commission of the Status of Women to stake out five of the most important women’s equality agreements to improve on in international law. The five areas of improvement are: realizing women’s full enjoyment of all human rights, strengthening the enabling environment for gender equality and the empowerment of women, maximizing investment in gender equality/empowerment of women, strengthening the evidence-base for gender equality/empowerment of women, and ensuring women’s participation in leadership at all levels. With these agreements in mind, Bachelet is now working hard to create an equal environment for women in Chile. In a speech written for El Pais on December 1st, 2014, Bachelet outlined the many ways in which women are oppressed in Chile.1 She noted that the fight for women’s equality is “multidimensional,” and requires the cooperation of lawmakers and citizens alike.One of her first steps in creating a more equal society was the transformation of Chile’s National Service for Women into the Ministry of Women and Gender Equality, which demonstrates her ideological shift from women’s services to the empowerment of women. Bachelet also acknowledges that many public spaces outside of the workplace need to be transformed into women-friendly spaces. While this does not mean that workplaces must mandate equality guidelines, Bachelet wants to change the culture of inequality so that education, communication, and public spaces are perceived the same between men and women in order to ensure safety and equality for all. Along with this, comes what is probably the most polemic part of Bachelet’s proposition: legalized abortion for women who have been sexually abused, whose fetuses are malformed, and whose lives are at risk due to pregnancy. Women’s safety in public spaces needs to ensure that women who use these spaces won’t be sexually assaulted or harassed simply because they are in a public space. In the future, Bachelet hopes to see an employment rate of 63% for women, a rate that is now at 58%, and an increase of women in poverty joining the workplace. In Chile, only 25 out of every 100 women in poverty has a job and Bachelet wants to increase the number of working women to 300,000 in the next four years. She also proposes a vast increase in nurseries and daycare facilities so that women with children can go to work or return to the job they previously had to leave behind. In addition to sending women in poverty to work, she wants to see women already on their way to a degree strive for jobs in the STEM fields (science, technology, engineering, and mathematics.) She notes that within the education system, the majority of students are women receiving high grades, but go out into the marketplace and earn less than their male counterparts. Providing STEM jobs for women may not necessarily even the pay gap but it would ensure that women will, in general, earn a higher salary and work in innovative companies that can move women equality and empowerment forward. Finally, Bachelet points out that there are not enough women in the house of deputies and the senate. Currently, 16% of the house of deputies is made up of women, whereas 18% of the senate are women. She wants both quotas to reach 25% in the near future as to ensure the promotion of women friendly legislation. 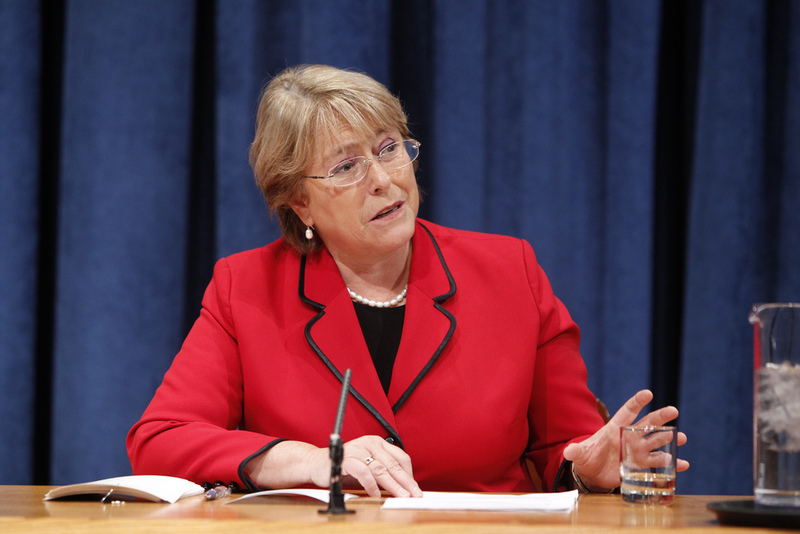 With the five tenets outlined by the UN Women in mind, Bachelet is compiling an extensive amount of new policies to ensure gender equality and empowerment in Chile. Her next steps will aim to make the society a more equal place for women, but this requires a shift in culture, which is the hardest part. If her ideas move forward, Chile will become more equal in its public spaces, economics, politics, and overall culture and women will have more equal opportunities in the workplace as well as in life.